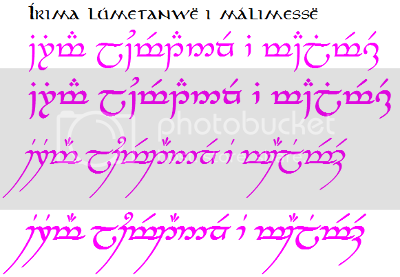 Hello, I´m new in the forum, so I present myself; I´m Laura, Laitaine in the elvish language, if I have understand well:). 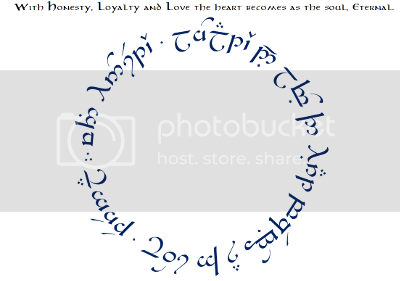 I´m in this post seeking for help, after seeing the valuable habilities of the ones who are translating to tengwar all the requests. I have find it stunning; how did you get that control of the language? You have my most sincere applause. 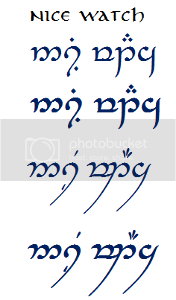 What I wanted to ask is how it would be written in tengwar, both in Quenya and Sindarin (I personally prefer Quenya, but whatever you can do for me it´s alright:) ) one quote for a tattoo : "Proud Little Hobbit" or something like that. That´s the meaning I want, you can change something if it´s needed, I don´t need the exact words translated. Your help would be really appreciated . P.D: English is not my mother language, I´m sorry if I had done some mistakes. Thank you!! Congrats on your baby boy!! I hope you two are bonding well and you're getting enough sleep!! Could you help me with transcriptions, any font, italic. Hi ! Just a quick entry to give you some news. I seem to be into a never-ending pregnancy. I can hardly sleep and my all of my body is a pain, but normally withing 2 weeks everything should be over and I'll hold this lovely boy in my harms ! I keep my fingers crossed so that it could be in the next days... today, why not ! But in these conditions, I have not been able to work on transcriptions as I would have loved to. If I don't give birth in the next days I'll try to do a few. raysgranita : your request is getting me a but confuse. 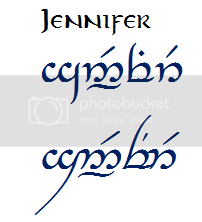 When I read it I understand that you ask me to change the name into Tengwar or Sindarin, depending on what is better for a tattoo… If I understood right, then it means that you understood wrong how it works . I’ll ask you to read the introduction (link in my signature), so you’ll understand that Tengwar a script, an alphabet with which we can write all the languages we want, and that Sindarin is a language, just like English of French. 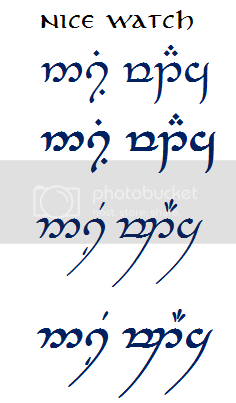 So it is possible to change the names for their Sindarin “equivalents” if you go on the Sindarin thread (explained in the intro) and then to write them with tengwar, or directly to write them with tengwar keeping them in English (if they are in English. If not, you have to tell me what language you consider them to be). Then you have to choose a font you’ld like from the list. T_Daugherty : Yes to everything. For the circle part, it might be easier to send it by email, so if you send me an email telling me who you are and what you asked (just because I receive many so that I don’t get confused ! ), we’ll save time when I’m done ! Mello-Drame : perfect ! I’ll just correct a word : “utúlië” (the accent). Pityanë : You forgot to tell me about the language in which these are. 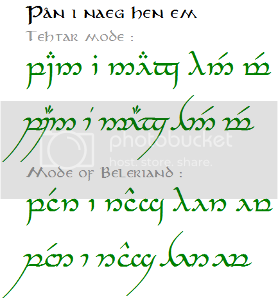 Pityanë looks Quenya, but please confirm. And what about Paulina ? Do you want me to treat it as English, or as from another language ? Liveyourdash : The first step you should take now is to read the introduction post of this thread (follow the link in my signature). 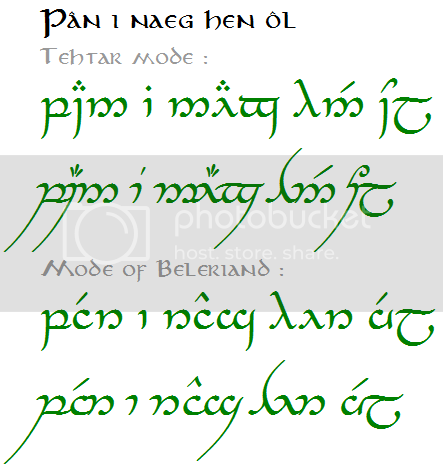 Because you ask for translation and transcription, and the translation into Quenya part is not something I handle here. You have to go to the appropriate thread, get the translation, and when you are ready for the transcription you come back, and you tell me what font(s) you want. Everything is explained in the intro, so please read it and tell me if you have any questions. For Ivar82 : The higher resolution will be sent by email. Hi again, I'm sorry I definitely misunderstood the way this whole process works! 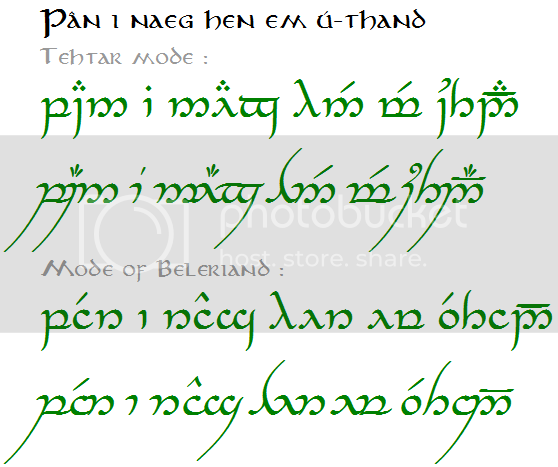 So I posted on the translation page to get "a ship in harbor is not what a ship is built for" but I was reading through some of your posts and you said you can keep it in English but do the elvish script? If this is correct I'd love to see what that looks like! As far as fonts go I am very unsure of what is what but I see a lot of TI - A+B ? Yes you're right. 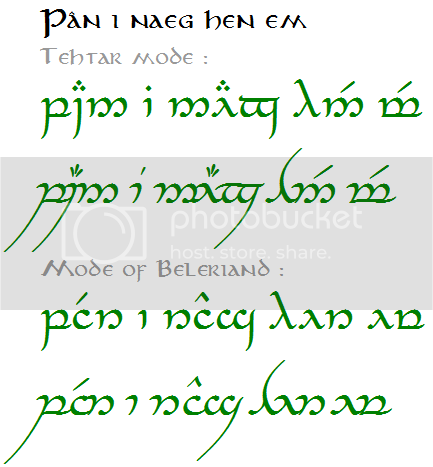 Pityanë is really Quenya and Paulina in English please. Liveyourdash wrote: Hi again, I'm sorry I definitely misunderstood the way this whole process works! 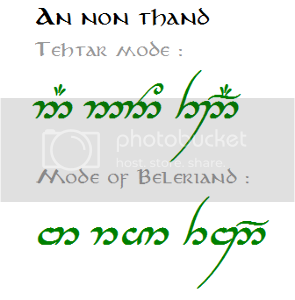 So I posted on the translation page to get "a ship in harbor is not what a ship is built for" but I was reading through some of your posts and you said you can keep it in English but do the elvish script? If this is correct I'd love to see what that looks like! As far as fonts go I am very unsure of what is what but I see a lot of TI - A+B ? ok, so for now I'll put your request in my list for mere transcription, and when you have the translated quote, post them here and I'll add them to your request. For the fonts, the list is also in the introduction, with the abreviations too... I guess you are talking about TA-I+B, which means Tengwar Annatar, italic and bold, one of the most popular fonts here (a bit like on the Ring, but bold). And I think that it's finally possible to post the circular transcription here without having to reduce the size too much... let's try, and if there is a problem just email me ! Okay thank you so much for taking the time to do these! So translated it reads "Cirya hópassë ua manan cirya ná carna". Again, thank you, and sorry for being such a newb! So good to see the thread up and running as good as before. Just wanted to peek in! 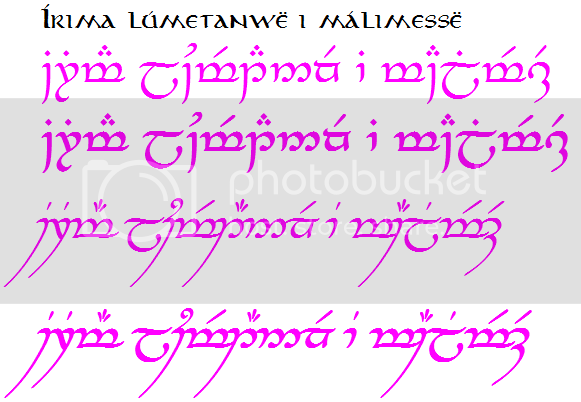 Can anyone please translate this quote for me into elvish language: ''Words are our most inexhaustible source of magic'' ??? 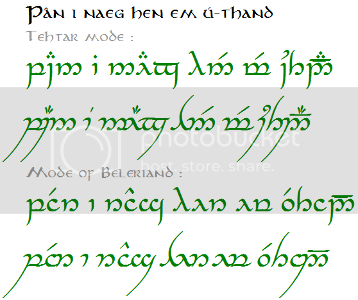 I found some sites for translation, but i'm not sure they're correct, so if anyone can help me, i want to tattoo this quote and i want to be sure. THANK YOU! Ar ilqua ahya telepta hyellenna. Ar tá cenilyes. Ninqui falassi, ar pella, haira laica nórë nu linta anarórë. Last edited by Perica on Sun Apr 17, 2016 6:37 am, edited 1 time in total. 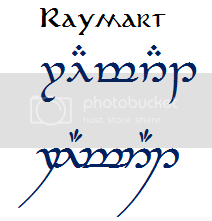 marijamarija123, check the Language Forum for the Quenya and Sindarin threads (by Gladhaniel and Xandarian) to get help with any "Elvish" translations. This is a transcription only thread. Perica, for myself, I've come to prefer mista mistëfanwa for two reasons: it actually means grey veil of fine rain while the other means silvery-grey veil of mist and because mistë is used in the Numenna translation of Into the West, which I believe was done by David Salo, the consulting linguist for the films. Just my opinion. It's not too late to modify your request, I'm sure. Being busy with a second son means Isildilmë isn't working at full speed. I also noticed that Salo used a conjugated form of ahya to translate change in the song, not vista. You should have waited for Gladhaniel's comments and approval of my ideas before bringing the results here. 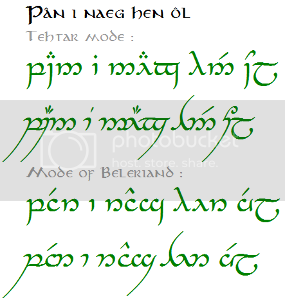 I already asked you to confirm a transcription of Quenya alassë for me. Now I was wondering whether you'd be so kind as to transcribe for me the equivalent in two other languages, please. It's for my mom's next tattoo! Content is not the same as happy. Contentment is not the same as happiness. I don't know if I'd be OK with content. I'm looking for the following translated: May the stillness of the stars watch over you. I can see that you have a list and I am patient! Stacey2907 wrote: I'm looking for the following translated: May the stillness of the stars watch over you. Hi! Please take a look at this post and specify which font(s) you would like to have, as well as the language of the sentence you're requesting. Quote 1: "I have loved you for a thousand years"
Quote 2: "If more of us valued food and cheer and song above hoarded gold, it would be a merrier world"
Quote 3: "Forever you and me"
Thank you in advance, I am looking to get several tattoos done very soon and I would truly appreciate the transcription. Sorry, I have been away over a month... I gave birth to an amazing little boy on March 28th, and I have to admit that to deal with two young boys is quite a challenge ! I'll try to give you a few minutes each weeks in order to complete the requests. Thanks for your patience ! I think it will look the best if it's written in TA-I, but if its not too much work I would love to see it in TA-I+B as well.